The other night the LIY team and I got together for one of the most fun girls nights ever. 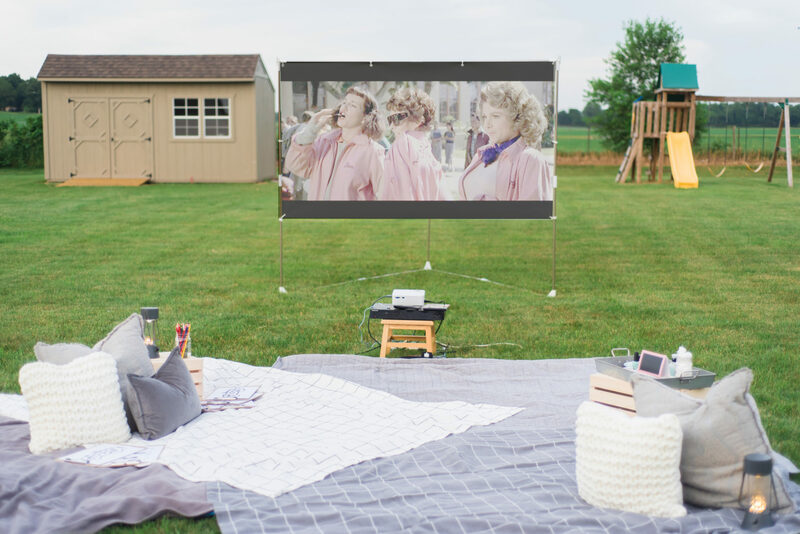 For years I’ve been seeing others partake in these Pinterest worthy outdoor movie nights on the reg and I always sat on the sidelines thinking “well that’s freaking adorable and looks fun” but never took action. 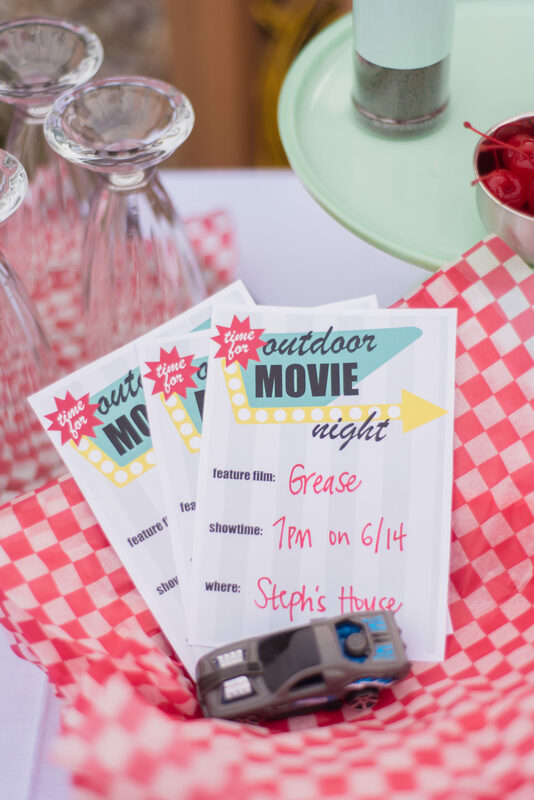 We decided it was time to lump ourselves into the cool crowd and throw our own outdoor movie night and we decided to do it up Grease style. If you and your girls are big fans of all things Sandy and Danny [Rizzo is a personal fave] this is the perfect excuse to gather and live out your leather pants and chocolate milkshake fantasies. Today I’ll be sharing the ins and outs of our party and how you can recreate the same thing with your girl gang, from recipes to free printables and activities to have on hand to up the fun factor of your evening. If there’s one thing we’ve learned from doing these girlfriend parties it’s that every time you choose to spend time with your friends, it’s time well spent. Make those memories ladies, you’ll never regret it. Anyhow, let’s jump into our Grease movie night and get this party started! For the fun record banner, we made that and yes, you can have it for free! Just click here and we will email you the file to print! Of course, one must have snacks for during the movie as well so popcorn and s’mores it was! I purchased this adorable Popcorn Machine to keep in the game room at the cabin and it just so happens that it also makes for the perfect accessory for an outdoor movie night. Just add in some classic Popcorn Bags and you’re set! Classic Coca-Cola and Reese’s s’mores and yup – nobody is leaving this party upset. Onward to the movie set-up itself! I was surprised by how easy it is to have a movie outside because like I mentioned earlier, I’ve always been an outdoor movie reject [current days version of beauty school dropout]. I purchased this Outdoor Movie Screen which is super easy to assemble and then take down and store when not in use and this under $100 Movie Projector to hook up to our DVD player and was all set [simply plug the DVD player into the projector with an HDMI cable]! You may have to use a sound bar or bluetooth speaker for extra sound which you just hook up to the projector with an auxiliary cord. With any outdoor movie, you need a few things to stay cozy and comfy. For starters, we threw a tarp down before putting any blankets down to keep the dew from coming through. One quick Target run and done – we picked up several throws, pillows and these wooden crates to use as side tables. To keep things entertaining we printed out a few different Grease coloring pages and set-up a nail painting station thanks to OPI’s Grease inspired nail color line. Wine may have made an appearance at this time. Oh my gosh how CUTE!!! So so fun! I’m so doing this!! I’m doing a dry run with the grandkiddos and a Disney movie! !